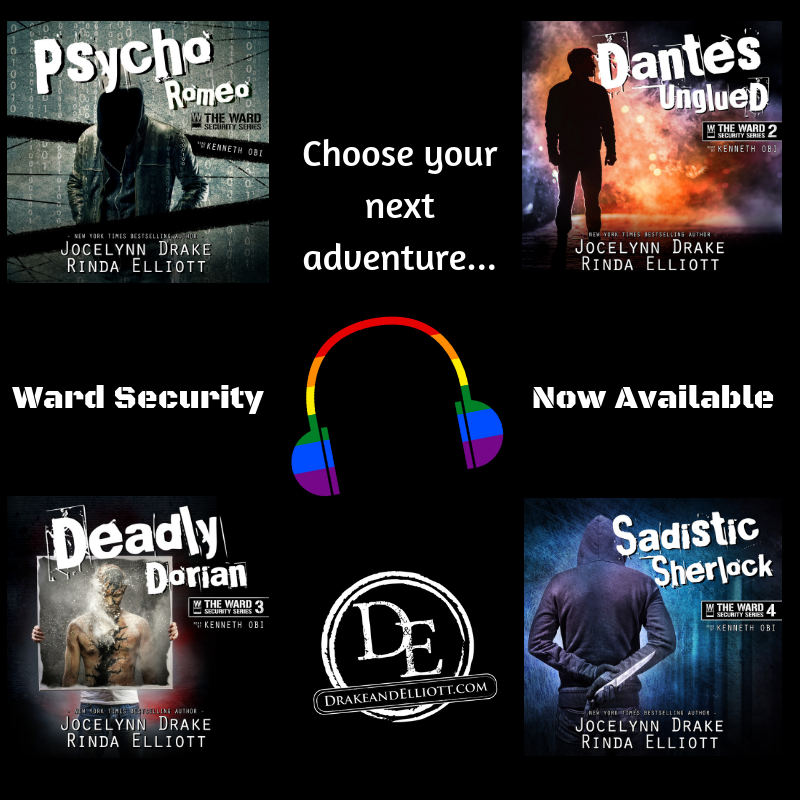 Ward Security Audiobooks: Are You Caught Up? It was with some anxiety that Rinda and I jumped into audiobooks earlier this year. Neither one of us listened to audiobooks in the past,but we were aware that a lot of our readers loved audiobooks. They are a great way to pass the time if you’re running errands or have a long commute to and from work each day. They are a great way to pass the time if you’re catching up on cleaning or maybe while you’re exercising. And we are excited to report that after many months, we now have all the books currently out for that series in audiobook! Yes, you can now listen to all the books released for that series in audiobook. Psycho Romeo: An internet famous app developer has been threatened by a stalker and there’s only one bodyguard he trusts to keep him safe. Dantès Unglued: A private investigator borrows one of Ward Security’s hackers to help track down someone attempting to destroy Cincinnati’s mayor. Deadly Dorian: Wealthy art dealer Marc Foster is himself the target for a killer and he trusts only Ward Security to discover which family member wants him dead. Sadistic Sherlock: Bodyguard Dominic Walsh is running from a dark shadow stretching from his past determined to destroy any future he has with silver fox Abe Stephens. Now is a great time to jump into the Ward Security adventure! We’ll be heading back into this series later in 2019 for another new story. You can keep updated on all our news by subscribing to our newsletter here.